This item is not available for purchase online. Please call us at 800.606.6969, or visit our NY Superstoreuwubrsdwuqxvycadtrqwdffxvtdvewwavtsq. 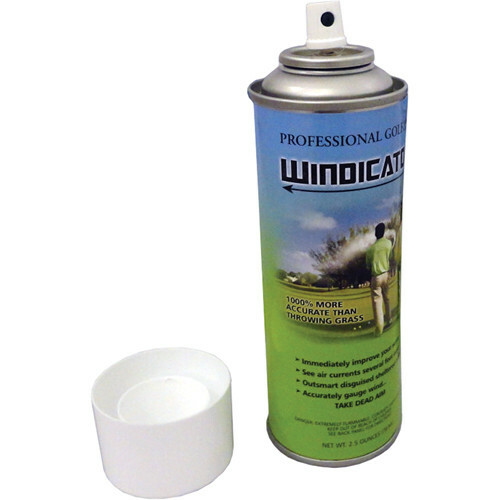 Windicator from CITC is a haze-creating fluid in an easily transported pressurized can. With Windicator it is possible to make air movements visible with short spurts or a continuous output. Placed the can on the ground the haze from the can shoots out horizontally along with the air movement. Air currents become instantly visible. Windicator enables the user to detect drafts around windows and check air-flow in vents. Golfers will find it invaluable as they now can see how the wind direction changes over distance. Laser beams can be made visible with this portable hazer. This haze is odorless and harmless, and is people- and animal-friendly. Use Windicator Haze for 10-20 seconds, then just lift the snap-down top with the edge of the lid and save the rest for the next time. The can contains 15 bursts of up to 20 seconds each. Box Dimensions (LxWxH) 9.0 x 8.0 x 7.0"